Snoop Dogg, at right, gets political in his latest music video where he is seen pointing a gun at a clown dressed like President Donald Trump, at left. President Donald Trump is firing back at Snoop Dogg days after the release of a music video in which the rapper points a toy gun at a clown dressed like Trump and pulls the trigger. 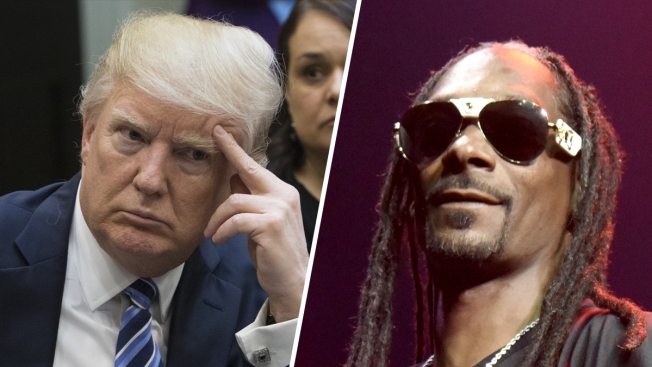 Trump tweeted Wednesday morning: "Can you imagine what the outcry would be if @SnoopDogg, failing career and all, had aimed and fired the gun at President Obama? Jail time!" The video is for a remixed version of the song "Lavender," by Canadian group BADBADNOTGOOD featuring Snoop Dogg. In it, Snoop Dogg shoots the Trump clown with a gun that releases a flag with the word "bang." The rapper was also criticized over the video by Florida Sen. Marco Rubio, who lost to Trump in last year's Republican presidential primary campaign.